India embarks on an arduous tour of South Africa with a lot of hope and optimism. Even though their past record in the Rainbow nation doesn’t exactly inspire confidence, the general feeling amongst pundits is that this tour could finally be the one in which India achieve their ‘Holy Grail’ of winning a Test series in South Africa. Since their maiden tour of South Africa in 1992, India have played 17 Tests in South Africa, out of which they have won 2, lost 8 and drawn 7. The table below gives the detailed summary of the series results when South Africa has hosted India. That record paints a bleak picture, as India have had 4 series where they did not even win a single Test. However, they did come close in 2006-07, 2010-11 and 2013-14. Moreover, this Indian team is on a roll. They have won their last 9 Test series, a world record, and they have an arsenal of fast bowlers which is probably the best in their 85-year-old history of Test cricket. Having said that, South Africa is a formidable team at home and will be close to full strength, so India will have their work cut out for them. Over the last few years, teams at home have ruled the roost in Tests and so India will have to be at their best to pull off their first ever Test series victory in South Africa. Here are 5 things India must get right to put one over the Proteas and win their 10th consecutive Test series. Ever since Virat Kohli became India’s full-time captain, there has been a clear policy of picking 5 bowlers, as he believes that gives India their best chance of taking 20 wickets and dismissing the opposition cheaply. However, in the second Test against Sri Lanka, they reverted back to playing just 4 bowlers and the skipper said that they wanted to give Rohit Sharma some game time. That indicates that they might go in with only 4 bowlers in the first Test at Cape Town. India tour South Africa only once in 4 years and they cannot afford to be defensive as they will not get many opportunities to win. They need to bite the bullet and play Hardik Pandya along with 4 other bowlers as they will need 5 bowlers to dismiss the Proteas cheaply, as South Africa have a formidable batting line-up. 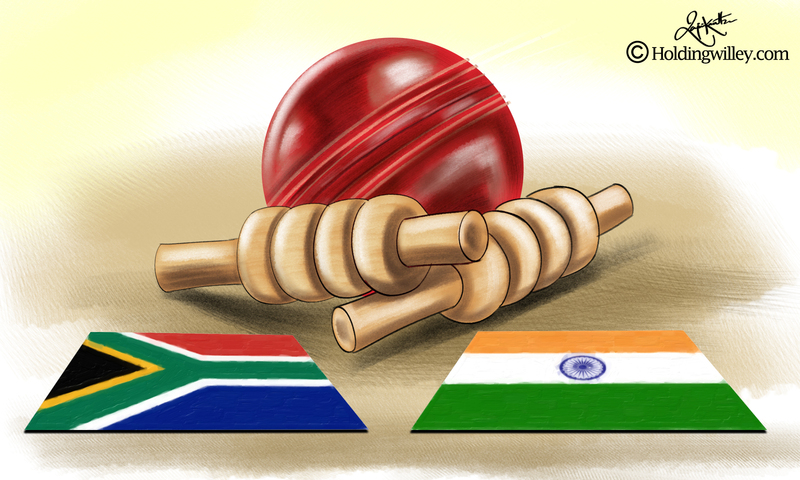 India have traditionally been a team that relies on spin to win matches but the wickets in South Africa are unlikely to provide much assistance to spinners. India need just one spinner in their playing XI. They also need to be practical in their choice of whom to select rather than just playing Ashwin because he is the lead bowler. If they feel that the wicket might aid spin later on, they should play Ashwin as he is best equipped to take advantage of a spiteful pitch. However, if the wicket appears flat, then Jadeja might be a better option as he can tie up an end and keep the runs down, allowing the pacers to attack from the other end. In the recently concluded Test series against Sri Lanka, India dropped a lot of catches in the slip cordon. Without being too critical or harsh of Sri Lanka, they are not the best Test side and India’s profligacy did not cost them the series. They cannot afford this largesse against the Proteas, as the hosts have a deep batting line-up full of great batsmen who will make the Indian’s pay for any lapses in the field. Ajinkya Rahane mans the slips when the spinners are in operation but he fields at gully to the pace bowlers. Virat Kohli explained this was because Rahane has very quick reflexes and is best suited at gully for the quick bowlers. However, Shikhar Dhawan and even Kohli himself have grassed a few chances in the slips. India need to make sure that they have the right fielders in the slip cordon if they are to take all their chances. Towards the end of the series against Sri Lanka, Pujara was seen in the slips and he did a good job, so India need to stick with him and maybe even try out Ashwin as a safe pair of hands. India is almost certain to go in with 3 pace bowlers. They need to be ruthless and go in with the best 3, and not based on seniority and experience. Ishant Sharma has been out of favour till recently and did a good job in the last series. However, there is no doubt that Mohammed Shami, Umesh Yadav and Bhuvneshwar Kumar are India’s best 3 fast bowlers. Shami is the leader of the pack and swings both the new and the old ball. Umesh is the quickest of the lot and is capable of getting reverse swing while Bhuvi is quite a handful on wickets where there is a bit of nibble and sideways movement. In spite of Ishant’s improved showing against the Lankans, India need to be ruthless and play their 3 best pacers for the first Test without being swayed by sentiment and talks of seniority and experience. Since the beginning of 2016, India’s openers average 39.61 for the first wicket in Tests, second only to Australia’s 40.37. What is heartening for India is that they have a problem of plenty for the opening position with Murali Vijay, Shikhar Dhawan and KL Rahul all having done well at the top. It is imperative that the openers blunt the new ball and put on huge partnerships to avoid exposing the middle order to the new ball, as that is a recipe for disaster. If you look at the partnerships of opening batsmen of all countries in South Africa since 13th November 1992 (when India toured for the first time), India’s average partnership for the opening wicket is just 29.27: the 4th highest after Australia, South Africa and England. However, a worrying sign is that their openers have just 2 century partnerships and 2 fifty run partnerships in 33 innings. They need to improve on that if they are to put pressure on South Africa’s bowlers. If they keep their wits about them, have the rub of the green and play their best, India could create history in South Africa.